I have barely had time to come up for breath to announce that the Orange County Mini Sessions are set for Saturday, September 28! They will be held in a park setting in the Newport Beach area. There are only 2 spots left. If you are interested please contact me right away. A mini session is a shorter version of a custom session with discounted prices. In the case of these Autumn sessions, it is a time for families to get some great shots to use on holiday cards. How is it different from a custom session? Unlike a custom session, the location is selected by Britain, the shooting time is much shorter, and shoot yields approximately 15-20 photos rather than the 30-40 usually in a custom session gallery. Who can be photographed during mini sessions? Mini sessions are open to adults, children, and even pets! Can we do multiple groupings during our mini session? We typically do more than one pose per session,but the sessions are too short to enable more than one grouping. For example, in the case of a family of 5, you will get a few great poses of everyone together, and I usually fire off a few quick shots of each child. In a custom session we would get all the kids in multiple poses, mom and dad alone, each child with each parent, all the girls, all the boys, throw in the grandparents even, we may travel to a second location, make a wardrobe change, etc. If you have a variety of family combinations, we would be happy to schedule a custom session for you. Mini sessions are offered throughout the year in Arizona, and usually 2 times a year (Spring/Fall) in Southern California. The photography session usually lasts 15-20 minutes. Your online gallery will be emailed to you one week . And will remain live for an additional week. Your Mini Session fee includes up to 5 hi-resolution digital images which will be available for instant download from your gallery. Additional print and digital packages will be available for purchase at a discounted rate. The $250 session fee reserves your date and time, and includes up to 5 hi-resolution digital images, with a limited copyright release. You can save up to 50% off our custom session pricing. 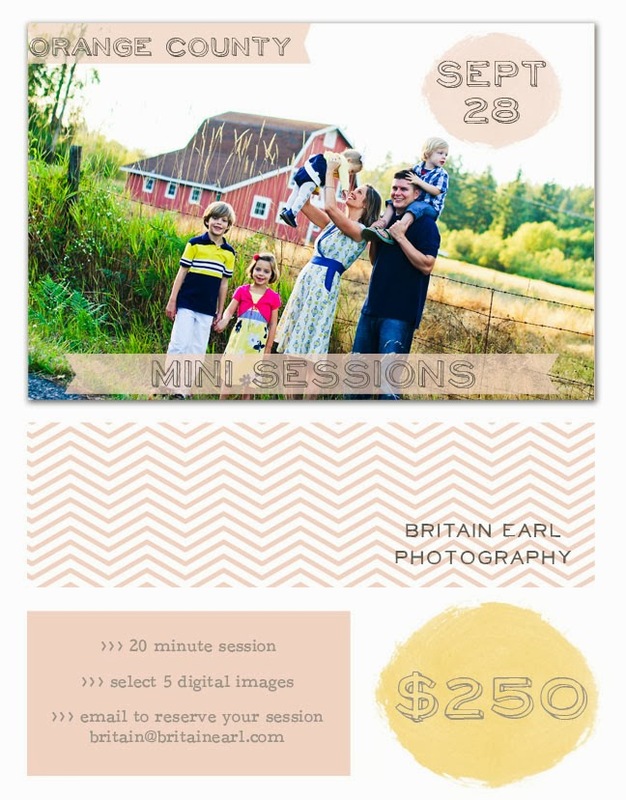 The Session fee alone saves you 50% since our custom sessions do not include digital or print products. Additionally, digital images and prints are available for purchase at up to a 40% off. What if we miss our scheduled time? We understand that sometimes the unexpected happens and you miss your appointment. We ask that you please contact us as soon as possible and we will try to reschedule.